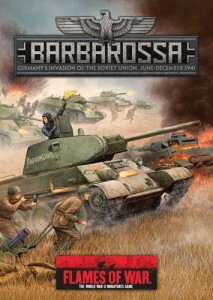 Battlefront gives us a look at their upcoming Flames of War book, Barbarossa, in this new preview. Operation Barbarossa began a struggle of epic proportions that would result in four years of bitter fighting between the Germans and Soviets. It all began in the early hours of 22 June 1941 with a German surprise attack across the border of the Soviet Union with three army groups and 3.8 million Axis soldiers. The Germans soon found many of the Red Army units they faced wanting, but other units held out with grim determination, fighting off the Germans until they were surrounded. However, the Germans were to encounter some nasty surprises against the Soviet mechanised corps' counterattacks, facing new heavily armoured Soviet T-34 and KV tanks. Red Army counterattacks, stubbornly resisting pockets, and the autumn rains, followed by freezing weather, delayed the German thrust towards Moscow. The freezing conditions played into the Red Army's hands, and they launched a counter-offensive that would push back the Germans back from Moscow!